This short video describes how to make a Denton Modification to control the forces of supination. It was created by Dr Jane Denton, Podiatrist, and can be used on custom made and some over the counter orthotics. Runners, given enough time, may develop some form of knee pain. This short article below makes the point to look for the cause above or below since treatment may be greatly influenced by what is found. The green squares show normal motion of the foot. Mild Pronation of the foot followed by resupination of the subtalar joint. 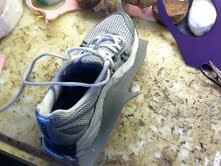 The Heel Lifts in propulsion just before the heel contacts on the opposite side. There is a smooth transition from heel strike to toe off without feelings of foot slap or inability to move easily. I was wondering if you could give me some advice. Three months ago I did some heel raises and foot stretches after a very long bushwalk. Two hours later I could not walk and had very mild swelling on my left foot. 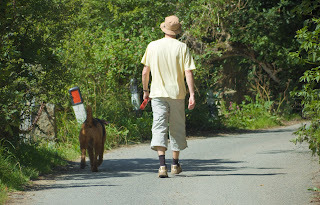 I could not weight bare for 6 weeks and within a day I saw a physio and podiatrist who diagnosed PTTD. 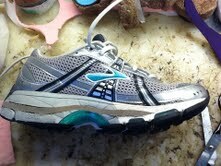 I faithfully did stretches to strenthen the post tib tendon, and wore the orthotics. I am slowly getting better, though not as quickly as I would like. I can walk short distances but walking up and down steps can give me a mild ache. I saw a sports doc who said that I would need surgery as my arches are getting flatter and an ultrasound confirmed accessory navicular, and the tendons were in tact with no tears and no nerve compression or inflammation. I have seen slow improvements but wish to avoid surgery and the sports doc said that I may if i wear aggressive orthotics , my current ones are rigid but dont have a huge arch in them. In your experience is it possible to avoid surgery? I have always worn supportive shoes and have not had problems with my feet. I would appreciate any advice that you have. By the way I love your site! Thank you so very much for your email. If you have seen slow improvements, wait it out. Do everything you can to create a painfree environment. If that requires you to wear orthotics and supportive shoes to the Opera, so be it. Respect your tendon. It has a long way to go to supporting you through life. Be kind to it for a few more months while you work on the swelling and strength of the tendon daily. .It is also an extremely unusual presentation of PTTD (posterior tibial tendon dysfunction), but more consistant with some tarsal tunnel syndrome (sharp totally incapacitating pain without swelling that was not there yesterday). Tarsal Tunnel is a nerve problem with different treatments and a possible low back cause. Hopefully the physio and podiatrist have ruled these out. Before you have too much physical therapy, consider an MRI to look at what tissues are irritated. Could be revealing. If negative, consider a nerve conduction test with a neurologist or physiatrist. So what should you be doing now? 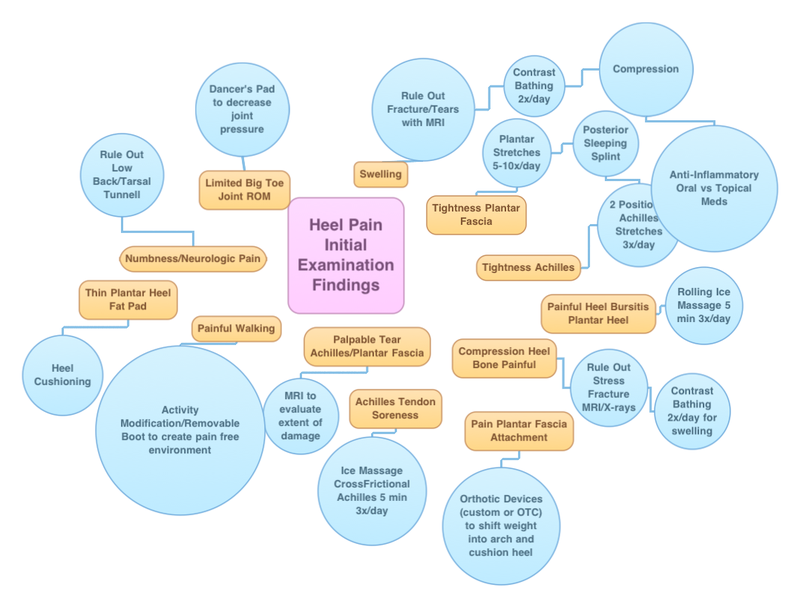 Create that painfree environment. Gradually strengthen your ankle, especially the posterior tibial tendon. Ice or contrasts or both three times daily to the sore area. 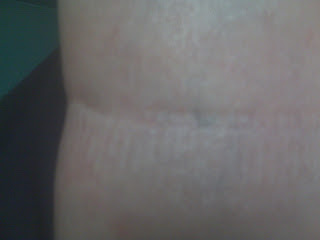 Wear a removable cast part of the day to reduce the motion across the area. 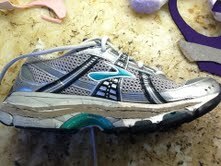 Wear orthotics and supportive shoes if they help with your pain. If not, seek advice regarding better shoes and better orthotic devices (may seem to be crucial if the pain is difficult to manage. If you plateau, where progress is at a stand still, perfect all the variables--better information gathering, better orthotics, better anti-inflammatory regimen, better painfree environment (?casting), and better strengthening program. MYF sent this response to my email. All of those deviations can lead to over pronation problems, over supination problems, or asymmetrical compensatory problems. These problems can effect the weakest link in the chain, anywhere from the foot upwards. See the link below and listen to the great Kapena music from Hawaii. As you watch someone walk, you proceed from the head, to the shoulders, to the arms, to the hips , then the knees, and on to the lower legs. As the green outline shows, it is ideal to have the legs straight with the knees centered over the ankles. It is so important with this assessment to make independent observations of the right side from the left side. Old injuries can produce calf size asymmetry (even when my chart above truly shows I can not spell). 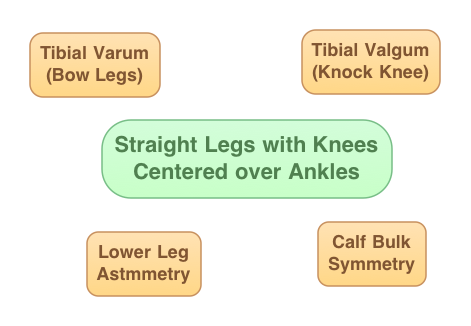 This asymmetry can greatly effects leg function. The tilts in the legs (tibial varum or tibial valgum) can be much different allowing the feet and ankles to behave differently. The video above shows tibial varum causing a varus tilt to the ankle which greatly effects how the foot and ankle align with the rest of the body. I am a runner (no more than 10k races) and have had a pain on the side of knee for the past month or so. I was told that it could be my IT band and to do stretches to help recover from the pain. I run in the City so I thought the pain might also be from running downhill. Dr Blake's Note: The Ilio Tibial Band runs down the lateral or outside aspect of the leg from the pelvis to the tibia. It most commonly causes symptoms on the outside of the hip or the outside of the knee. Can you recommend the most efficient stretches and any other suggestions for a quick recovery? Dr Blake's Note: IT Band Syndrome is almost a pure runners problem. Rarely ever see it in other sports. Here are some common IT Band stretches. Should I be icing my knee after every run? Dr Blake's Note: IT Band Syndrome is a form of tendinitis. All the common treatments of Tendinitis should be employed to help. Please see the link on BRISS for tendinitis treatment. Is it possible that it could be something else? Dr Blake's Note: Definitely, it is uncommon for women to get IT Band tendinitis around the knee, but not rare. If there is any swelling, it is not IT Band Syndrome. If it does not feel better with stretching during a run (I love the lateral wall lean stretch while running), it is not IT Band Syndrome. 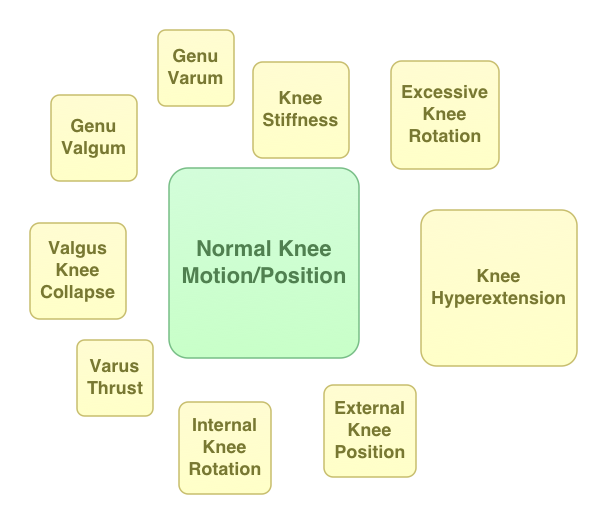 It could be lateral knee joint pain, lateral collateral ligament, lateral hamstring, etc to name a few. If the pain is on both knees in roughly the same spot, it is most definitely IT Band. Would a knee brace be unnecessary if it really is my IT band? Dr Blake's Note: If it is IT Band, knee braces should not help, and may hurt. If you experiment with a simple knee brace while running, and you feel somewhat better, continue to wear. It take me a few days to recover from the pain after a run. I have my longest race coming up in September and don't know if it's safe to run because the pain is still bothersome. Lesley, Thanks for the email. Definitely do not run through pain that starts in the middle of a run.You will definitely make it worse. Stop, try to stretch out the IT Band, and then continue to run only if the pain subsides. If you can get PT for it with the upcoming race, go for it. They can normally calm it down quite well. For a race in September, it is too late to change you biomechanics too much, but is would be okay to make a shoe change if your shoes are too worn down (usually over 500 miles). Hope this helps. When I first started working at Saint Francis Memorial Hospital in San Francisco in 1981, I joined their already prestigious Center For Sports Medicine. I was the first podiatrist in an MD clinic. Patients were coming from near and far for treatment of their knee injuries. The renowned orthopedist Dr James Garrick called on my biomechanics expertise (I was just off a Biomechanics Fellowship) time and time again to help with his knee patients. I always found it funny, yet exciting, that I would spend some days never looking at a foot problem. Is the knee moving a normal amount? Or is it too Stiff? Or is the motion Excessive? Is the rotation of the knee placing it in the center of the leg? Or is the rotation too internal? Or is the rotation/position too external? Are there structural issues to be concerned about? Is there genu valgum (knock knees)? Is there genu varum (bow legs)? Are there very damaging forces at the knee? Is there hyperextension of the knee? Is there varus thrust of the knee? 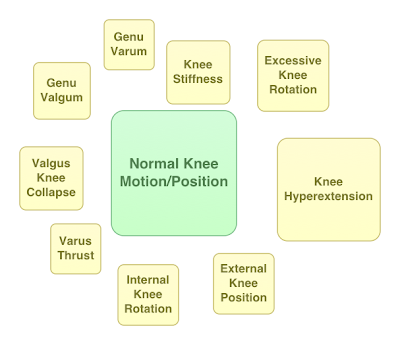 Is there valgus collapse of the knee? When watching someone walk and/or run (also known as gait evaluation), it is important to look at what the hips are doing. The hips are a reflection of shoulder motion (right shoulder and left hip), intrinsic hip and low back conditions, and foot motion (or lack of). The green circle reflects normal hip motion and symmetrical right to left hip heights. 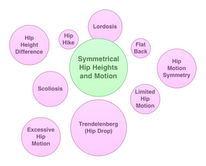 The light purple circles represent some of the more common conditions seen. I am always asking if the hip evaluation represents shoulder abnormality, hip and/or low back abnormalities (including scoliosis and pelvic asymmetries), or foot and knee rotations. It is exciting to try to put the patterns together and make some sense out of them. I remember one of my first race-walkers that I treated. Maryann had right hip pain with a long left leg, excessive foot pronation, exaggerated hip motion even in normal walking, and very tight ilio-tibial bands. As I co-treated her with a physical therapist, we successfully leveled the hips, stopped the excessive pronation, and stretched out the IT Bands. Yet, her hip pain was just as bad. A low back consultation felt that her pain did not come from the back, and the physical therapist did not feel that it was referred pain from her knee. 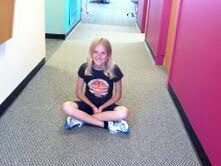 Finally, I went to the track for one of her race walking training sessions. As I watched her walk, I realized and her coach, she did not move her left shoulder (or her right shoulder for that matter). The hips should move equal and opposite to the shoulders (right hip and left shoulder) for maximal efficiency and ease of motion. The solution to Maryann's problem and then many years of painfree race walking was to get her to move her shoulders freely. Podiatry Video Quiz #5: Which foot insert shows more supination tendencies? This short video demonstrates the findings seen in over supination. The three videos to follow represent a patient with posterior tibial tendon dysfunction left worse than right, even with attempted posterior tibial tendon reconstruction on the left with subtalar arthroesis. When I first met with Ruth she had the following gait pattern reflecting a resting heel position of 12 degrees everted on the right and 17 degrees everted on the left. What was the treatment? I felt with the Inverted Orthotic Technique and Varus Shoe Wedging that I have touched upon in other posts I could get her to the ideal heel vertical position. On physical examination, she had the range of motion to get to heel vertical which was a crucial finding. 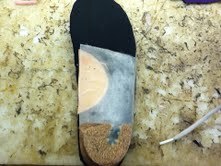 The Inverted Technique gives a 5 to 1 approx heel correction (ie 25 degree cant equals 5 degrees inversion force). 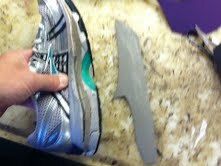 35 degree Inverted cant (giving 7 degrees of actual heel change) is normally my highest initial correction. It is my starter orthotic to see how the patient responds. After the 35 degree orthotic gave its 7 degree correction, with the patient still painfully pronating into the orthotic device, I changed to 50 degrees (10 degree change predicted) with 4mm Kirby Skive (2-3 degree change predicted) and a 1/4 inch varus shoe wedge (2-4 degree change predicted). 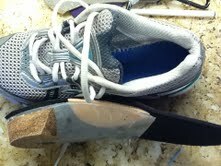 The following video is with this orthotic and shoe combo. I apologize in the video that I switch the right for the left. The right side (12 degree everted heel) is easily centered to vertical with the combination of inversion forces (cant, Kirby skive, varus wedge), but the left (17 degree everted heel) still is not great. This weekend I am increasing the inversion to 60 with slight more Kirby Skive and higher varus cant (up to 3/8 inch) keeping it all the way out to the toes. I hope you can appreciate that with orthotics and shoe modifications, as long as you can physically get the patient to a vertical heel position, you should be able to accomplish that in gait. Symptoms related to the poor mechanics, in general, should resolve once the patient is in a vertical heel position. 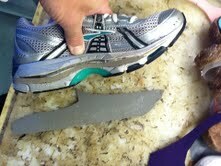 Here is the latest left orthotic device with 60 degrees Inversion force and 3/8th inch varus midsole wedege. There was no change to the right. Hopefully, the almost complete correction of the left is noted. Podiatry Video Quiz #3: What types of Pain should be Avoided? Aphrodite, Athletic Trainer, Saint Francis Memorial Hospital, San Francisco, answers the question on what types of pain should you avoid. It is crucial to understand good vs bad pain while rehabilitating an injury. See the link to the separate post on that subject. I am very excited that this is my first guest posting ever. It is on Osgood Schlatter's Syndrome, a common knee problem seen in teenagers. This article was written by Alyssa Jacobs. Alyssa is a health enthusiast who promotes healthy lifestyle practices, and has a passion for fitness, exercising, and dieting. Along with physical fitness she promotes healthy habits for skincare practices, and works to provide you with the best acne treatments. The painful, deforming condition known as Osgood Schlatters syndrome can be a minor irritation or in some cases extremely painful. Osgood Schlatter is the result of physical strain mainly in patients in the age range 9-16, and involves pain and swelling just under the knee cap on the tibia bone. This condition usually coincides with a growth spurt, resulting in strain from quadriceps muscles pulling on the patellar tendon. It is important to understand what activities may cause this condition, what the treatment options are, and what this condition will do to an individual. are the leading contributors for this painful condition. Some of these sports may include tennis, track or basketball. Pain can be even more extreme with acute knee impact. Symptoms can last anywhere between 12-24 months, or until the particular patient has fully grown into their body. By limiting activity, and practice, athletes might not be able to have their competitive edge, and could even lose out on things like a college scholarship due to lack of activity from severe pain. That is why it is very important to have this condition evaluated early and start treating the symptoms right away. Treatment for Osgood Schlatter's can come in many forms. The most common form of treatment is called "RICE". RICE stands for rest, ice, compression, and elevation. There are also other treatment options, such as physical therapy, stretching, braces, crutches, or even casting for up to six weeks. In very severe cases and when an individuals bone structure has matured, surgery may be needed to correct damage done to the bone. However, if symptoms are treated early enough, stretching can usually take care of the problem. In regards to stretching, it must be a detailed and thorough stretching process. Consult your physician, or review stretching procedures. Taking tension off of strengthening leg muscles can be very beneficial for your bones and tendons. Ten second stretches to the left and the right is just not going to cut it. Stretching must become routine. Mornings, nights, preworkout, and post workout are all good times to stretch. Also if you are going to stretch, do it right! Osgood Schlatter should never hold you back from being active. Consider using braces, or knee pads to protect from direct contact. Treating Osgood Schlatter is very important to a teenagers physical fitness and health. Treatment can also help teens stay on the right path to successful athletic careers. Do not ignore the symptoms as they may become more complicated, and require more dramatic treatment. Consult your physician to find a stretching and treatment regimen that would work for you. As you stretch the quadriceps, keep in mind all the general principles of stretching in the video and text below. Podiatry Video Quiz #2: Why is Sunshine good for Bone Healing? 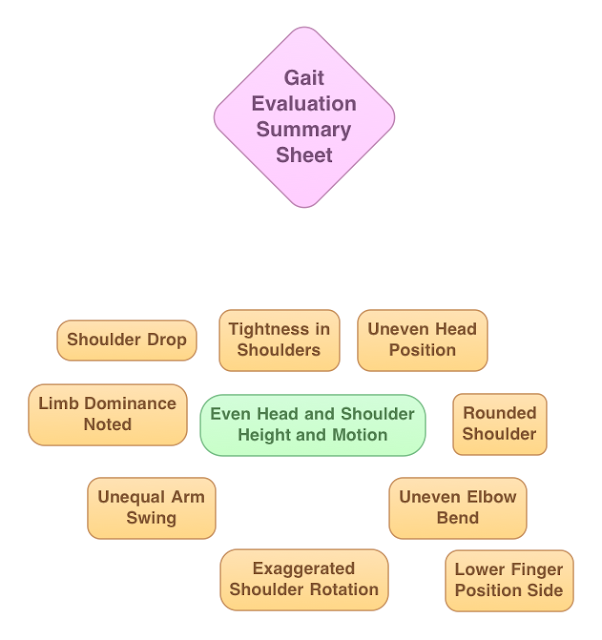 I will be presenting more and more gait evaluation videos since I just got my first iPad. I am so excited. I hope this initial attempt at presenting the basics of a podiatric gait evaluation are helpful. I am looking for signs of abnormality that can tie into the treatment of injuries and/or explain various pain syndromes. Knee High Socks that cut off fragile venous return of blood back to the heart. 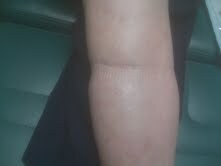 If you have friends or family with support hose or compression socks to fight swelling, advise them of this problem. This indentation warns us that the compression is too great, and that it is probably worsening the problem. If the problem gets worse, the tightness of the next pair of socks ordered is normally tighter (and more uncomfortable), and the medication used can get stronger. Both are bad scenarios for a simple to resolve situation. Experiment initially with several versions of support hose (Mediven, Jobst, Varin, Juzo are real common to find) to see if any work. If you are still struggling, try those that go just above the knee (thigh high). Closer look at the indentation left by a supposedly good fitting compression sock. Hallux Rigidus is a limitation of motion in the Big Toe Joint which may or may not be painful. thanx for such a quick reply! my foot pain is nowhere near the toe, it's on the bottom/inner side. its very crampy. usually feels better when i'm walking. when i sit at work then get up it's worse. i've never had surgery except tonsils and so it would be my last resort. i read your article about hallux rigidus and like your approach. i live in nj. do you know of any drs in this area? bergen/passaic co? thanks so much for your input. it's nice to know there may be an alternative treatment. The following video is of a variation of hamstring stretches for the patient with chronically tight hamstrings who has trouble ever getting loose. That being said, one of the common causes of chronically tight hamstrings is a version of sciatica. 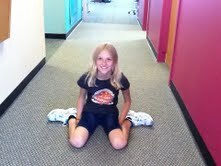 This great hamstring stretch can irritate the sciatic nerve, and you really do not want to do that. Have a physical therapist or physician verify that you do not have sciatic nerve tension causing hamstring strain before starting this stretch. Also, make sure you are properly doing the normal upper and lower hamstring stretches for one month several times per day to workout some of the tightness. The link to these stretches are below. Also, start with 10 minutes of heat followed by 5 minutes of ice for 1 month three times per week before attempting more time. Never stretch through pain, ever!!! I see from your many blogs that you actually know what you are talking about and I am very relieved. I have been dealing with this for a long time and after many mis diagnosis and thousands of dollars wasted I finally got the verdict.. 2cm short on left side with onset of scoliosis. I also have a very pronated right foot. Dr Blake's Note: A short left side with a more pronated longer right side is fairly typical. The longer right side pronates to collapse the arch and drop the hip some of that side. 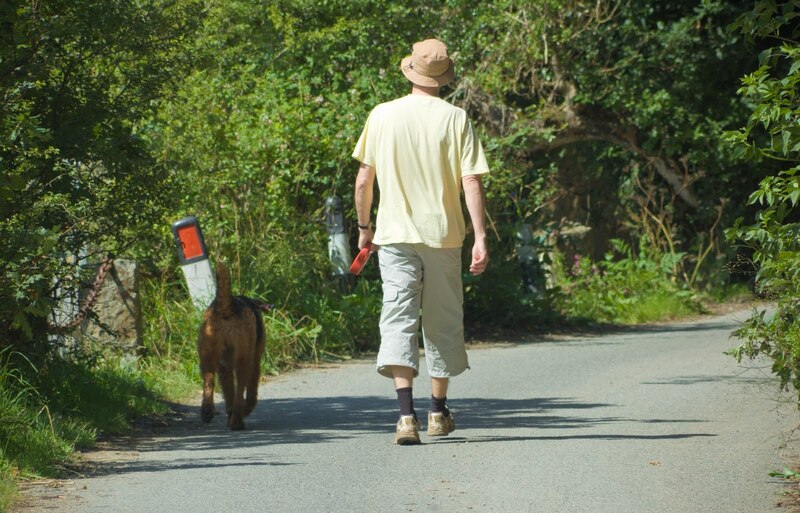 If limb dominance is seen in gait, it will be seen on the longer right side (see posts and videos on limb dominance). Here is where the crucial initial decision in treatment comes. The physician/therapist must correlate symptoms to mechanics and decide if you correct the pronation first, or the leg length difference. If you correct the pronation, since the longer leg pronates more, it will actually have a net greater lift in the arch, further raising the right leg. The long leg will become longer, but the biomechanics of pronation will be much more stable. Typically, I tend to correct the short leg syndrome first with lifts, and you can see a marked decrease in the pronation of the long leg (it does not need to pronate as much). I went to an orthapedic and was given the plastic inserts to correct the pronation and the short leg. I still had problems and went to a back doctor who took xrays and determined that after looking at my orthodics that they were not sufficient as the one made for the short leg had no lift. Dr Blake's Note: This is probably a mistake by the lab, but the doctor and patient should easily be able to see if the shorter leg has been lifted more than the opposite side. He sent me to another person who made me a "cheap" heel lift. I have a very hard time with movement on my right leg, I kinda "shuffle" I don't have full hip motion.. Is this because of the pronation??? Dr Blake's Note: It is rare that pronation causes this type of restricted hip motion. It is probably related to the compression forces on the longer right leg jamming up the hip joint. It could also be related to early degenerative changes in the right hip (wear and tear). The hip xrays should have caught that. Predictably there are more wear and tear on the longer side at the hip joint, than on the shorter side. It is very annoying and bothers me when I run. It is also very tight in the front "hip flexor?". I need your help. Willing to fly out if needed to get the proper orthodics and treatment. I live in Texas. If you know of any one here that you can recommend who actually knows what they are doing that would be o.k. too. P.S. one of my main problems is I wear cowboy boots alot and the orthodics don't fit….. I can only wear the heel lift in them. Dr Blake's Note: It is normally quite easy for a shoe repair store to add 3/8 inch lifts to the heel and forefoot of a cowboy boot outersole after the patient is used to the lift in an athletic type shoe. I ntroduced by researchers from Temple University, Philadelphia, this version of quadriceps stretching can be very powerful in loosening up chronically tight quadriceps or post operative knee surgery. Of course, the individual physical therapist or physician will have to decide if it is appropriate for you. There should never be any pain with stretching. It is totally appropriate to start with the 2 minute heat and 1 minute ice ratio in any amount and then gradually add more time if needed to achieve the desired stretch. This video demonstrates the home version commonly used.